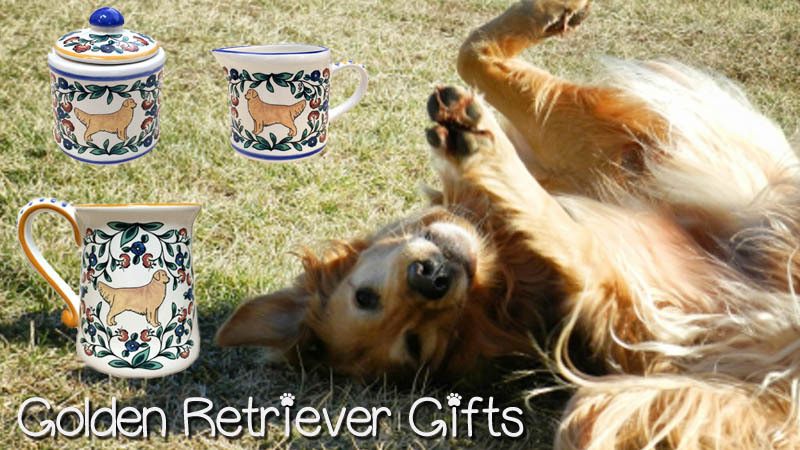 Welcome to the Golden Retriever Gifts page. Here you will find an assortment of gifts, handmade for you in our Northern California Studio. Our Golden Retriever Merchandise is unique in that all of the art and design work is done here so that you are getting something that is original, and made with care in America. Our assortment of Golden Retriever items includes wine stoppers, mugs, treat jars, dipping bowls, creamers, sugar bowls and more. It is important that you have a choice in the look of the Golden Retriever design, so in addition to our standard Golden coat color, you may also customize your pottery to better reflect your Golden Retriever's color. Simply use the "custom" option in the drop down menu of the item page and upload a picture via the photo upload field on that page too. There is a small art fee of $8.00 that is applied to all custom work. Our Golden Retriever gifts feature the dog in the center, surrounded by a colorful floral pattern and accents of cobalt blue and golden yellow. The pottery has a Meditteranean look that is very special and can't help but make you smile. Plus, it's a great way to keep your pup close when you have to be apart - a mug or small dish on your desk at work will keep your mood lifted.